The price for Sale is US 3´ 500,000.00 Dls. 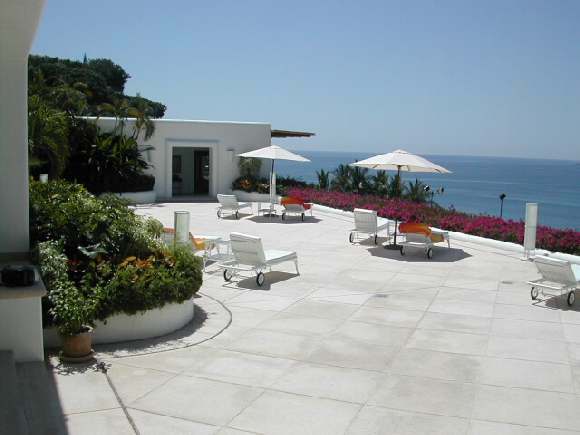 This residence is located in the best area of LAS BRISAS over one of the mountains that surrounds the Acapulco Bay which have a variety of picturesque scenery and marvelous views. In winter is warm enough to permit the pursuit of all the outdoor activities that this beautiful place has to offer. The residence gives an atmosphere of elegance and charm and from there can be reached in few minutes the excellent Beaches near this area, very good Restaurants, Discothèques and a variety of Entertainments. The Virgo residence has 6 bedrooms. Five at street level of which two of them are suites, each with their private bathroom and generous closets, electric fan on their ceiling, air conditioned, a king-size bed and a small terrace. The other three are normal bedrooms with a king-size bed also with electric fans on their ceilings, air conditioned, private baths, closets and also a terrace. Climbing 10 stairs is the master bedroom which has 2 private bathrooms, 2 closets, a king-size bed, electric fan on its ceiling, air conditioned and also an small terrace. All the bedrooms have a splendid view to the bay. On this same level is a very big and impressing terrace with cots for sunbathing. From there you can be overlooking the bay and also an infinite view to the sea and the sky, seeming together to be without limits. On the end side of this terrace there is a very attractive swimming pool where you can exercise your crawl or any other type of swimming because it is big enough to enjoy it. From there climbing only six stairs you enter to an open area to the reception with no wall on the front, so from there you can have the same view that has the terrace. In here is installed the TV connected to the SKY Satellite service and also a stereo to hear the radio or the CD´s. On the left side is the dinning-room with two round tables for 8 persons each and there is also the bar area. Near the dinning-room there is a staircase which takes you down to the gymnasium and to small steam room. The kitchen is very modern, has a pantry in which are installed a freezer and a refrigerator and also in the kitchen there are two more refrigerators, an industrial stove, a wash-basin for fruits and vegetables and a dish-washing machine. In the service area there is a laundry with a washing and a drying-machines for clothes. Also in this area there are 4 bedrooms with their private baths for the people who give the service to the residence. The persons who attend the guests are a cook with a scullion, a chamber maid, a waiter and a house boy. There are 5 places for parking the cars outside of the residence.